Just in time for the new year, net plus-minus for the current NCAA Division I college basketball season is available! By net plus-minus, I mean that the team’s performance with that player on the floor is compared to the team’s performance overall. It is measured on a per possession basis. For example, if a player has an overall plus-minus of +5, it means that his team is expected to outscore the opponent by five points over an average-paced 40 minute game. For overall and offensive plus-minus, a more positive number is better, while for defensive plus-minus a more negative plus-minus is better. However, you must approach these numbers with caution. First of all, it is very early in the season. Most teams have only played 10 or 12 games, so plus-minus with such a small sample is very unreliable. As the season progresses the numbers should become more accurate. Secondly, as I’ve mentioned before, the official play-by-play data is filled with errors, so for some players the numbers may be slightly off. Also, some players and teams aren’t available, so if there’s a team you’d like to see that’s not already there, let me know. Finally, we must remember that all plus-minus stats have their own strengths and weaknesses. This is not adjusted plus-minus, so a player’s teammates are not taken into account. Therefore, if a poor player is often paired with an excellent player, the poor player may look better than he actually is. With all of that being said, below is a spreadsheet containing all of the data. To sort by team, click on the filter at the top and choose which team you’d like to see. Also, if you click the arrow at the top left, you can download the file as an Excel spreadsheet. If you notice any errors, please let me know. The following is part of a weekly series at the Orlando Magic blog, Third Quarter Collapse. Last week, I tracked the defense of the Magic. Thanks to positive response from the readers, I have decided to do it again. For a full a description of each statistic I track and what they mean, see last week’s article. Basically, what I did was watch the game last night and keep my own statistics (things that are not in the box score). Defensive statistics are often quite limited, and techniques such as manually charting and looking for certain things are often necessary to get a clearer picture. Again, if you don’t know what any of those things mean, please read last week’s article. This was a particularly difficult game to track. Utah’s offense involves a lot of pick-and-rolls and other types of screens, so defending it is very much a team effort. There were many plays where it was hard to give any individual credit or blame. Perhaps in the future I will tinker with giving partial credit. There were many occasions when a Magic defender could not keep up with his man through off-the-ball screens, and this is reflected in the statistics. Vince Carter was the biggest culprit. A player’s defensive statistics are highly influenced by his matchup. That’s why bench players often look better than starters; they’re going against the other team’s reserves. Dwight Howard was a beast as usual, both in one-on-one defense and help defense. He forced 13 misses while being responsible for just four makes. The rest of the Magic’s players give good effort on defense, but I’m pretty convinced Howard is reasons one through ten why the Magic are so good defensively every year. It’s a shame MVP voting and overall popularity reflect offensive abilities more than anything, because after tracking Howard’s defense for two games, I don’t think it’s crazy to say he’s the best player in the league. It’s just that most people’s definitions of “best” are different than mine. LeBron James is a better offensive player, but Howard’s defensive impact is undeniable. Don’t forget that Howard was often matched up against Carlos Boozer, an offensive stud. Howard was able to hold Boozer under his season averages while also helping out all of his Magic teammates. In his return, Jameer Nelson played solid D.
Anthony Johnson could not replicate the defensive performance he had against the Pacers and T.J. Ford. Williams abused him a few times in the fourth quarter. Rashard Lewis rebounded nicely from his poor defensive performance last time. Some of you suggested that poor defensive job was an outlier, and you may be right. It didn’t hurt that Mehmet Okur couldn’t buy a bucket, though. Recently I took a look at the diminishing returns of rebounds, assists, steals, and blocks. As you may or may not have noticed, one common type of statistic was missing: shooting. Today I’m going to fill in the blanks using the same approach as last time. If you haven’t read the previous article, the premise is simple. For each lineup in the NBA last year that appeared in at least 400 plays, I project how they will do in each stat using the sum of their individual stats. For example, to predict a lineup’s offensive rebound rate, I simply add the offensive rebound rates of each of the five players in the lineup. 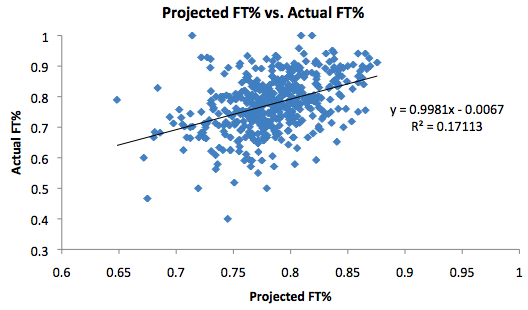 I then compare this projection to the actual offensive rebounding rate of the lineup. These steps are followed for each lineup and for each statistic. If there are diminishing returns (i.e. 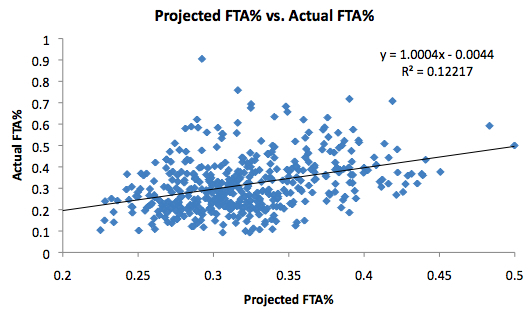 in a lineup of five good rebounders, each player ends up stealing a little bit from his teammates), the correlation between the projected rates and the actual rates will be significantly lower than one. In other words, for each percentage of rebounding rate a player has individually, he will only add a fraction of that to the lineup’s total because some of his rebounds will be taken away from teammates. If this still isn’t clear to you, be sure to check out the old article. Once you’ve done that, this article will make more sense. Back to shooting. I’ve decided to take a look at the diminishing returns of eight aspects of shot selection/efficiency: three-point shooting percentage, three-point attempt percentage (the percentage of a player’s total attempts that are threes), close (dunks/layups) shooting percentage, close attempt percentage, midrange shooting percentage, midrange attempt percentage, free throw shooting percentage, and free throw attempt percentage. To project a lineup’s percentage in one of those categories, I can’t simply add up the five individual percentages. 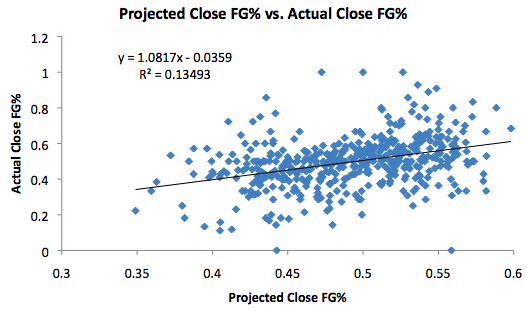 For example, a lineup of five 30% three-point shooters is not going to shoot 150% from beyond the arc. Instead, I have to calculate a weighted average for the lineup. Therefore, each player’s three-point shooting percentage is weighted by the amount of threes he took. The same approach can be taken with attempt percentages. 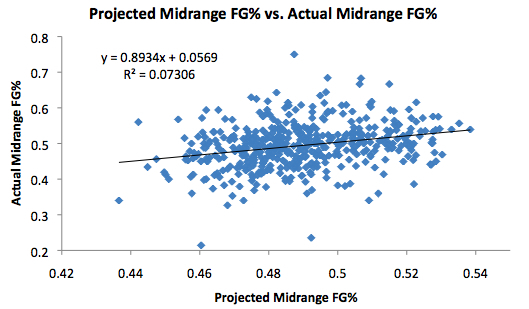 For some statistics, such as free throw percentage, we shouldn’t expect to see any diminishing returns. After all, adding a great free throw shooter to a lineup shouldn’t make the other players in the lineup shoot worse from the foul line. 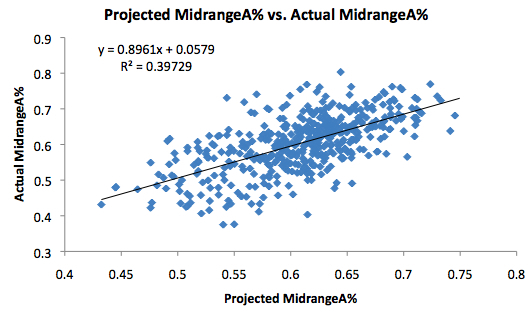 However, with other stats (especially attempt percentages), diminishing returns seem more possible. Here we see the slope is just about 1. However, the standard error for this slope is 0.21, so the results are pretty inconclusive. How about three-point attempt percentage? Again the slope is just about 1. This time, though, the standard error is just .04. Therefore, we can say with pretty good certainty that there are no diminishing returns for three-point attempt percentage. In other words, adding a player to your lineup that likes to shoot threes is going to add a proportional amount of three-point attempts to your lineup total. The slope is actually above 1 this time, although it’s less than one standard error away from 1. 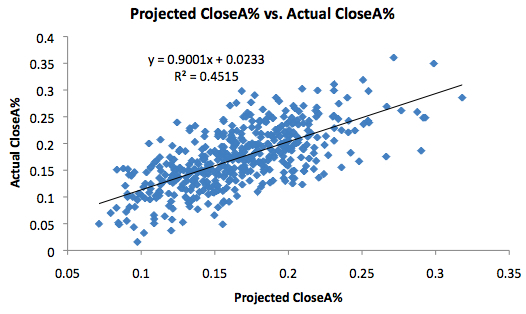 There definitely is no clear evidence of diminishing returns for close shooting percentage. Adding an efficient player around the basket to your lineup will probably not make your other players less efficient around the basket. The standard error for this slope is just .05, so we may be seeing slight diminishing returns. But not much. The standard error for this one is pretty large (0.15), but again there are no real signs of diminishing returns. These results are pretty similar to those of close attempt percentage. The slope is less than 1 and the standard error is pretty small. Again, though, the diminishing returns effect appears to be quite small. As I mentioned in the beginning of the article, we shouldn’t expect to see diminishing returns on free throw percentage, and we don’t. Just like the rest of the stats we looked at, we don’t really see a hint of diminishing returns for free throw attempt percentage. Unlike statistics such as rebounds, assists, steals, and blocks, shooting (in all of its forms) doesn’t seem to have the problem of diminishing returns. A player’s shooting efficiency will have a proportional impact on a lineup’s shooting efficiency, and his shooting tendencies will have a proportional impact on a lineup’s shooting tendencies. There are other ways to attack this question, though, and in the future I plan on doing just that. For my previous piece on the Magic, I charted hustle stats such as deflections, loose balls, missed blockouts, etc. While these things are all important, perhaps the area in which hustle is most important is defense. Although it takes more than just good hustle to be a good defender (as a certain Mr. Howard will show us later), effort is one of the keys to being a good defensive team. Therefore, I decided to track defensive plays in last night’s contest between the Magic and the Pacers (this time, I only kept track of the Magic’s stats). I imagine most (if not all) NBA teams track these on their own, as well as companies such as Synergy Sports. The rest of this article will explain what those numbers mean. I will also provide a few observations and notes about the contest. The first column is “Forced Misses.” This is pretty self-explanatory, although I should explain a few things. First, forced misses don’t only occur on an individual’s man-to-man assignment. A help defender that forces a missed shot would receive the credit. Second, I conservatively rewarded a few forced turnovers as forced misses. These were situations in which a player caused his opponent to turn the ball over (through traveling, bobbling the ball, etc.) by applying good pressure and staying in good position. The second column is “Baskets Allowed.” This is also self-explanatory, with one caveat. If a player made a bad defensive play that eventually led to someone from the opposing team scoring, he was the one credited with an allowed basket. For example, on one play, Jason Williams allowed his man to penetrate into the lane with ease, forcing the Magic to help and rotate. The Pacers swung the ball and ended up with an easy three-pointer. Although Williams’ man did not receive any points or assists for the play, Williams was penalized for allowing the basket. The third column is “Good Help D.” This occurred when a player came off his man to either help a beaten teammate or to make a good play such as causing a turnover. When Dwight Howard met the opponent in the lane and forced a miss, he was credited with a “Good Help D.” When Ryan Anderson strayed from his man for a second and reached in and knocked the ball loose from another player, he also received credit for good help defense. As you can see by now, many of these statistics are subjective (which is both a great thing and a bad thing). The fourth column is titled “BB/MD.” This stands for blow-bys/middle drives. This occurred any time a Magic player allowed his man to drive right past him without the use of a screen (in certain cases, when there was a switch on a screen and the new defender allowed the opponent receiving the screen to drive by, a BB/MD was assessed). A BB/MD did not have to result in a made basket to be counted. The fifth column is titled “Lost Man.” This was recorded every time a player failed to stay on his man, resulting in score. This occurred most frequently in one of two ways: either a player simply wasn’t paying attention and allowed off-the-ball movement (such as a backdoor cut) for a score, or a player failed to chase his man quickly enough through screens. The sixth and final column containing raw data is “Silly Fouls.” While obviously the most subjective of the six categories, it was generally pretty easy to determine. Fouls that occurred off the ball and away from the play were the biggest culprits. The rest of the data is computed based on those six categories. I included each player’s minutes played to serve as a reference point. “FG% Allowed” was calculated as follows: Baskets Allowed / (Baskets Allowed + Forced Misses). This statistic does not mean the field goal percentage of the man-to-man assignment. Because Forced Misses and Baskets Allowed are not always credited on a man-to-man basis, FG% Allowed is a bit more complicated. Obviously, a lower percentage is a better percentage. The final six columns are the six raw categories calculated on a per-minute basis. Like last time, I calculated them in the form of “minutes per stat” as opposed to “stat per minute.” This is to avoid presenting very small numbers. For positive stats such as Forced Misses and Good Help D, a lower number is better (in other words, a player achieves these stats more frequently and therefore in less minutes on average). For negative stats such as Baskets Allowed and BB/MD, a higher number (or no number at all) is better. As amazing as this might sound, Dwight Howard’s impact was possibly even stronger than the box score indicates. He altered a ton of shots in a night in which many of his teammates seemed to struggle defensively. He was able to help his teammates and alter the Pacers’ offense considerably. It didn’t hurt that the opposing centers weren’t looking to challenge him very often. Other than Howard, Anthony Johnson and J.J. Redick had the two best defensive performances. Despite his age and perceived lack of speed compared to T.J. Ford, Johnson was able to play solid one-on-one defense and force a lot of misses. It’s not surprising he ended up playing 27 minutes despite coming off the bench. Redick, although not challenged as often as Johnson, also made a few good defensive plays and forced some missed shots. The only blemishes on Redick’s defensive stat line were the silly fouls. He certainly did not agree with the calls, but three times he was called for defensive fouls away from the ball while fighting for position. He was the only Magic player to record a silly foul. The man Johnson replaced, Jason Williams, struggled on the defensive end. He had a difficult time preventing Ford from penetrating and generally played poor pick-and-roll defense. The Pacers built an early lead partially by attacking him. The Magic’s two highest-paid players were mediocre at best on defense. Vince Carter’s performance, which wasn’t terrible, can possibly be excused because of his great offensive play. But Rashard Lewis complimented his offensive struggles with some defensive struggles. He allowed seven baskets while only forcing three misses, and he let his man blow by him into the lane four times. Lewis made some defensive strides last season, and he must be careful not to relapse this year. Ryan Anderson struggled a bit on defense, although not because of a lack of effort. He allowed five baskets (second-most on the team behind Lewis), but did have a nice steal. Marcin Gortat won’t be happy about the measly six minutes of playing time he received, but he was generally pretty effective on defense when he was on the court. I enjoyed tracking the individual defensive performances of the Magic, and I think this type of information sheds a great deal of light on what’s going on beyond the box score. Although I don’t know what Synergy Sports or the Magic track defensively about their players, I imagine data such as this is of interest to them simply because it’s so useful. I plan on doing this again soon. Just some personal information that I thought should be out there.